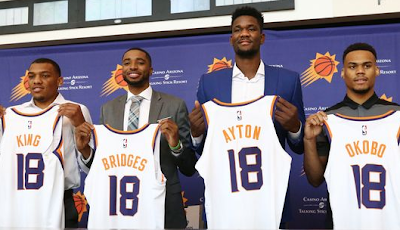 19-Year old, Deandre Ayton, a Nigerian, has completed his journey from the Bahamas to the NBA. 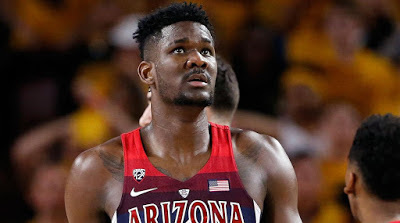 Ayton, who the Phoenix Suns selected as the No. 1 overall pick of the 2018 NBA Draft last week, will now embark on an NBA career that will pay him millions. On Monday, sportswear company Puma announced it had signed a four-year, multi-million dollar endorsement contract with Ayton that reportedly could pay him more than $1 million a year to endorse the brand's shoes and clothing. Meanwhile, Ayton's selection as the first pick of the NBA Draft almost ensures that he will sign a contract with the Suns that will pay him an estimated $6.8 million in his first year as a professional player, and he could get paid as much as $8 million. Several years before his skills on the basketball court tho, he was a kid trying to decide whether to work a summer job with his dad or practice his favorite new sport.